Mystery surrounds the disappearance of thousands of blank ballot papers for Eastbourne and Hastings which went missing when a van was stolen on Tuesday night. The ballot papers had been produced at a printing firm in Dagenham, Essex, which had been contracted to do the printing by Electoral Reform Services. They had been loaded in to a van ready to be driven to Eastbourne and Hastings but police say that on Tuesday night (April 28) the van was stolen. It is not yet known how or where the van was stolen but it is not believed to have left the county of Essex. The ballot papers stolen were 130,000 destined for Eastbourne for voters to fill in on Thursday May 7 in the parliamentary and borough elections plus an estimated 70,000 for Hastings voters for just the parliamentary election. Now thousands of fresh ballot papers, in different colours from the original ones stolen, will have to be printed and delivered in time for the elections. A spokesperson at Electoral Reform Services said the organisation would not be commenting at this stage and was in touch with returning offices at the councils affected. 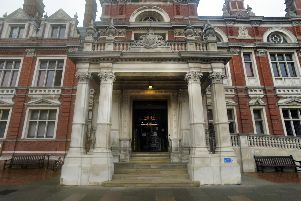 A spokesperson at Eastbourne Borough Council said this afternoon the theft meant that all the ballot papers intended for use at polling stations on May 7 are in circulation and in the possession of persons unknown. “This is, of course, a criminal offence and a police matter,” said the spokesperson. “We are not yet aware of the details around the theft. However, we have to assume that the ballot papers on board the van will not be retrieved and, as a priority, take action as appropriate.